Marching toward an empty building: "The only thing they're going to be putting pressure on is the grass," Rep. Barney Frank told The AP in 2009. 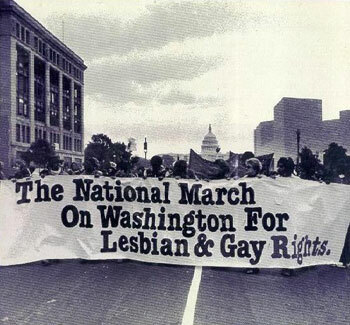 Yesterday evening I posted briefly about activist Robin Tyler’s desires to organize another national LGBT march on Washington, this time in 2012. I pointed to the five alternatives I suggested when activists in San Francisco called for a similar march in 2009, ultimately leading to the National Equality March in October of that year. Back in 2006 (0r sometime around then, I’m not entirely sure), Robin Tyler ramped up efforts to organize a national march in 2008. (On a side note: What’s up with organizing these things in huge election years?) I was recruited to start building support for the march in the Greensboro/Triad area of North Carolina. I started a little website, tried to get others involved in the planning processes, spoke to student groups and community members and… the idea went no where. No one I knew then was interested in helping to organize a national march when there was so much work to do on the ground in their schools, communities and in our own home state. The time, money and other resources spent on getting people to Washington, D.C., for a one-day, feel-good, accomplish-nothing rally was better spent organizing locally, lobbying locally and creating change locally. It’s been nearly a year-and-a-half now since the 2009 National Equality March, and despite big promises of after-march action in all 435 congressional districts across the nation, march organizers (many of whom are now involved in GetEqual) have done nothing to move their mobilized hundreds of thousands toward that goal. Small GetEqual chapters have started up here and there, but nothing has come close to the master plan march organizers had in mind. Similarly, no one so far has pointed out any single direct benefit gained from any of our community’s past national marches on Washington. I’m willing to listen and weigh the evidence, but as it stands I know of no victories, successes or changes that came as a direct result of encouraging thousands or even hundreds of thousands to blow hundreds or thousands of dollars in traveling for to the national mall for one day’s worth of chanting and holding signs. Tyler said the process of organizing a national march would trigger more activity in the states than what is currently taking place under the leadership of both state and national LGBT groups. “[L]arge national marches on Washington, which take over a year to do on that scale, produce activists and activity from every state,” she said. National marches do create activists and activity in every state, but the activity is focused on getting people to Washington and money raised for the event. Never in any significant way is the activity focused on creating change at home. This “trickle down” theory to activism is just as flawed as Reaganomics. National marches on Washington are not effective. They are not effective at creating change in the Capitol. They are not effective at creating change in the states. They certainly aren’t effective at creating change in the thousands of small cities and towns scattered across our country. If activists like Robin Tyler are truly interested in creating change in this nation, then they would seriously consider giving more support to equality initiatives focused on the state and local levels. Our movement has made significant progress at state and local levels and we stand to make more, if given the resources that is. If you want to have a national gathering, try going to a Creating Change conference. There you’ll at least learn something, meet new and valuable friends and allies and have the real resources to start doing the work of equality at home. But if education and true motivation to create change is not want you’re really after, then go ahead and plan a national march on Washington. You’ll just spend a day walking and marching and chanting and holding signs. When you go home, you’ll feel really, really good. But you’ll have exactly the same amount of resources you left home with: zero. 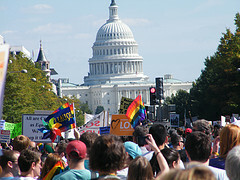 Here we go ‘round the mulberry bush: A 2012 LGBT march on Washington? The Washington Blade reported Sunday that veteran activist Robin Tyler is ratcheting up her previous call for a national LGBT march on Washington, D.C., in 2012. Anyone feeling a bit of deja vu? I was not at the National Equality March but I know many Interstate Q readers were. Here’s the space to share your experience, process the event, and ask questions. I’m looking forward to all of the insight!